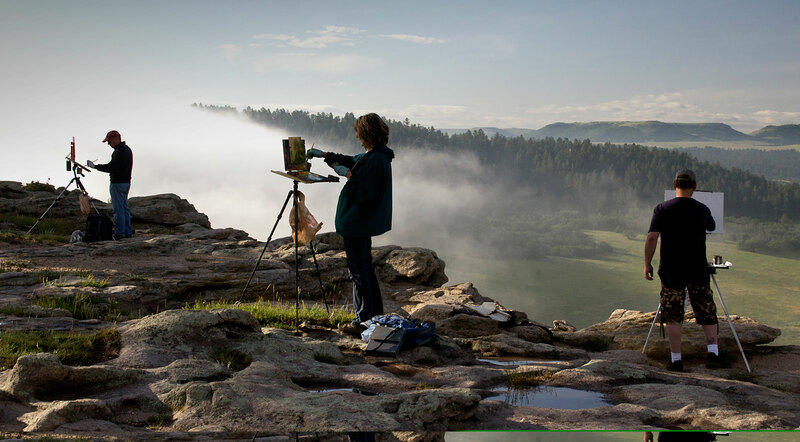 Every summer, a group of artists from across the country gathers in the Front Range region of Colorado for an exceptional opportunity — a week of painting conserved public and private landscapes. The annual “Capturing the Beauty of Open Land” event, created by the accredited Douglas Land Conservancy (DLC), connects the art community to land conservation. Patti Hostetler, DLC executive director, realized that almost everyone has a wildlife or landscape painting in their home or office so building relationships with artists and art collectors allows DLC to reach new supporters who are already benefitting from land conservation. DLC encourages artists to explore local conserved lands that are open to the public, and engages with landowners to provide access to spectacular private landscapes that are not generally open to everyone. Now in its third year, the event has become so popular that an application process was needed to select the artists invited to participate. The week of painting and workshops culminates in a gallery exhibit with hundreds of pieces featuring scenic open spaces of the region. This year, DLC added three plein air workshops for kids to the exhibit. The art show and sale serves as one of the conservancy’s most successful fundraisers while providing the opportunity to share their mission and goals with artists and art buyers, many of whom continue to support the organization after the event. Catherine Waterston is Western program associate at the Land Trust Alliance.